Capturing life's moments, and making them life long memories. 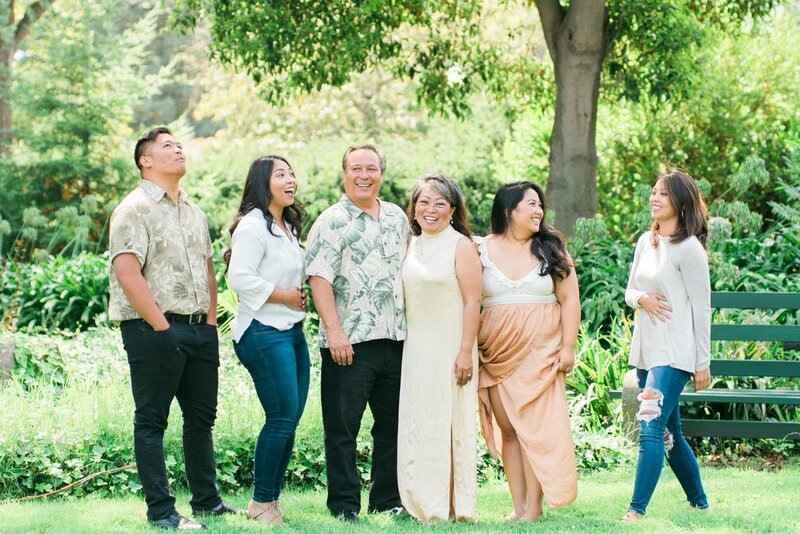 On a beautiful Labor Day weekend under the midday sun and wind saturated in Bbq, we were able to capture the Leong family. This beautiful Hawaiian based family was sooo fall of life and happiness. Though they have relocated to the Bay Area you could still see that “Hawaiian” mentality. What does that mean? They were so chill and you could tell how important family is! I love shooting families, because family is so important to me also. Even more so I love seeing older siblings reunite and recreate old memories as if they had just happened the day before. Every photographer has there style and eye. (At least they should!) I am currently a fanatic when it comes to using nature to frame my subjects, along with taking negative space and making it super dreamy and romantic. Below I’ll will break down briefly what these are and how you can create artistic portraits with only your phone! Framing is just like it sounds! You use your surroundings to create a “frame” around your subject. You can use trees, mirrors, leaves, and so much more! Framing helps not only center your subject, but also adds range, depth, and even contrast. All great things! The best way to capture great framing is to look for holes! I know your thinking huh? Yes, look for gaps in plants, items that drop down, or even cut outs. Then use your home button on your phone (Circle on bottom of iPhones) to center your-subject. You may have to move around and play with angles. You want the subject to be centered with that home button! And that my friends is some simple tricks to change those iPhone Portrait Mode into some fun and new fine art portraits! Now go out there and try it and don’t forget to tag us in your post we’d love to see how it works for you and what you capture! We couldn’t be more happy to wrap up our last newborn lifestyle session with the Banks family!! We been there since their first one to their latest baby boy. It’s was definitely a bitter sweet moment. I won't lie I might have shed a tear on my way out. Yes you read that right and I am sure many of you might have on V's face right now. So let me explain how we came to this decision. As our company continues to expand and take on new endeavors we want to make sure we continue to provide all our clients with superb service and selections. In reality we know this means narrowing in our focus and work. As of September 1st we no longer will be offering any of our newborn sessions. We are definitely going to miss shooting those precious faces, and we hope to see them as they grow in your family portraits! I also feel confident with several of my fellow Bay Area friends and photographers who offer these sessions still. So do not fret, your still in the best area/cities to get amazing portraits of your new bundles. We are sad to go personally, but despite this we are sooooooo excited for all the new things to come. Especially for all our clients! Kind Hearted Images is hard at work planning and organizing some really great new additions and projects. Next year are wedding packages will have some wonderful additional and even more reasonable packages for our local brides who are looking to capture small intimate weddings! Also, we have some new publishing arriving and sessions for our growing Bay Area tech and business companies; even better we have mini-headshot session arriving in September to help support small business, start ups, and local business! There is sooooo much I can share, but we want to keep you on those toes! So keep up with our BLOG and INSTAGRAM as we reveal all our updates over the next few months! Stay tuned and as always thank you for your support! As for now keep scrolling to see how we wrapped up our last Newborn Lifestyle Session with our day one family the BANKS! We tremendously love these two parents as we seen there love and family grow! They recently welcomed their beautiful baby boy 'August-Rayn'! I am extremely obsessed with that name; so unique and fresh for the baby scene. Enjoy the images, and we say farewell to a long run of sweet faces that delicious baby smell.